Watching all the movies on the Warner Bros. 50-movie box set that I bought for cheap. This week the random number generator bores me to death as it makes me sit through The Blind Side. Here’s what happens: Loosely based on the life of pro football star Michael Oher, the movie depicts Oher growing up in poverty and struggling at a posh Christian private school. He’s given a new home with well-to-do mom Leigh Anne Thohy and her family, where he learns all about football… and family. Why it’s famous: After years of being one of the most-liked people in Hollywood, it was about time for Sandra Bullock to get an Oscar. Too bad it was for The Blind Side, and not a good movie. 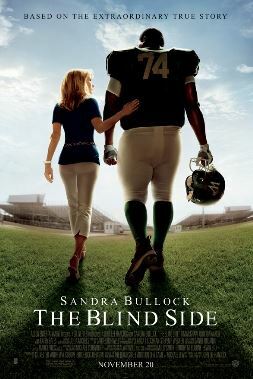 Get your film degree: The Blind Side has been oft criticized for being culturally insensitive, and, yeah, I can see that. The movie’s most laughable scene is when the suburban mom has to teach this kid how football is played, all while the kid’s coach is standing right there. Movie geekishness: There’s only one football game in the entire movie, at the mid-point. If this is a sports flick, shouldn’t it end with the excitement of the big championship game? Thoughts upon this viewing: Just dreadfully dull. At one point, I got up started cleaning my house because I forget this movie was still playing. Next: Everybody comes to Rick’s.